Are nightshades overwhelming you? 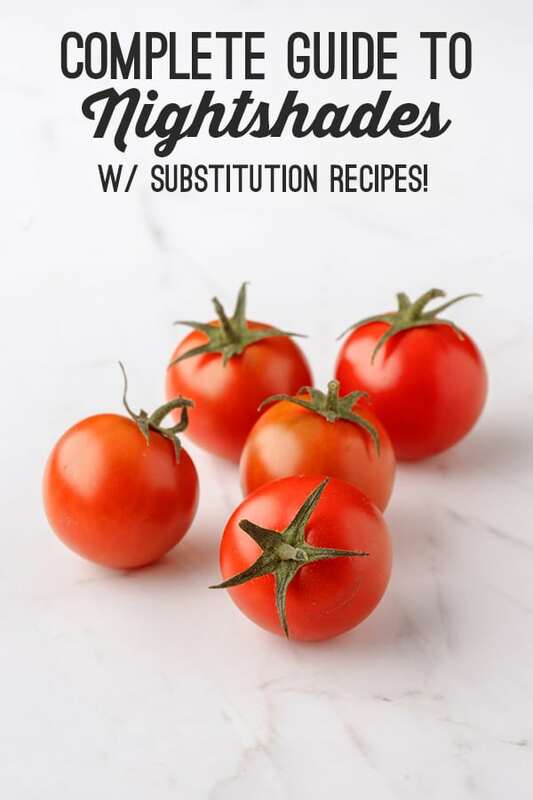 Here’s your complete guide to nightshades featuring why they matter, a full list, and substitution recipes! Nightshade vegetables seem like healthy, nutrient-dense additions to any diet. Tomato is known as a cancer fighter, bell peppers are commended for their nutrient density, and eggplant is a common low carb swap. However, not everyone can tolerate nightshade vegetables and many deal with inflammation and aggravation of chronic illness as a result of eating nightshades. With all of the healing that I’ve been able to do in the past several years, one thing has always eluded me… nightshades. Nightshades have been one of the single hardest things to reintroduce into my diet. 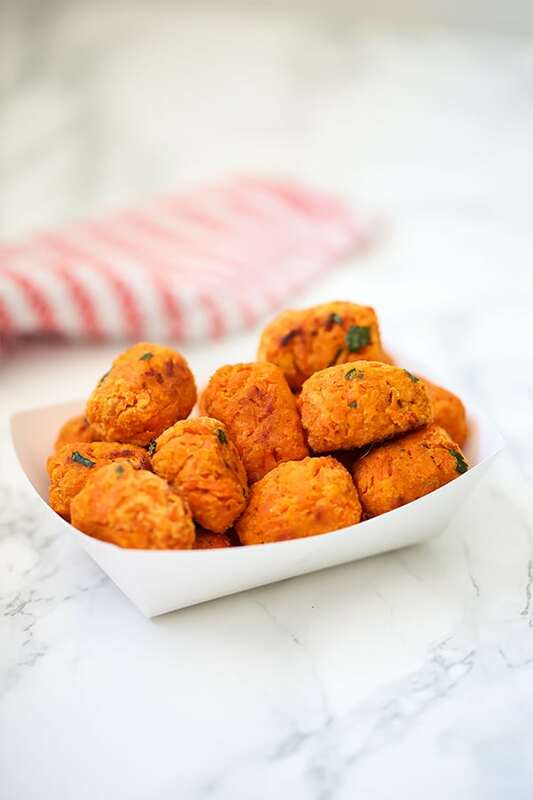 Not only are they delicious, but they’re crazy sneaky! It’s not always obvious if there’s potato starch in a gluten-free bread or paprika in a breakfast sausage. You have to be incredibly aware of what you’re eating, and how your body is acting. My nightshade intolerance was so inconvenient that I just wanted to ignore it. However, constantly adding fuel to the inflammation fire is not a great practice for those with inflammatory illnesses. As much as I didn’t want to, I became hyper-aware of nightshades, my symptoms, and learned all about what they and why they matter. My awareness of nightshades has been transformative for healing my Hashimoto’s and getting my gut health and inflammation under control, and that’s why I’m sharing it with you! Nightshades belong to the Solanaceae family and include thousands of edible and inedible plants. Are Nightshades Inflammatory for everyone? Why would you want to avoid them? Not necessarily. Nightshades do have a lot of nutrient density on their own and can be a healthy part of a balanced diet for many. By no means would I ever suggest that the human race as a whole needs to go nightshade free! Have one of these conditions but don’t feel like you have nightshade issues? I was in the same boat. I didn’t particularly feel a difference when I ate tomatoes, so why would I avoid them? Not having an obvious reaction to an inflammatory food is common, and doesn’t necessarily mean it’s not inflammatory for you. What can happen is that our body can be so inflamed that we just don’t notice the nuances anymore. That’s why elimination diets like the autoimmune protocol are the gold standard for nailing down food intolerance as they allow your body the chance to anti-inflame so you can actually determine whether or not you have a reaction when you reintroduce the food. How do you substitute nightshades in recipes? Coming from an Italian family, my dad always used to joke that spaghetti sauce ran through his veins. Uh… ditto. I love marinara sauce, but it really doesn’t love me back. I went a few months being nightshade free until I discovered nomato sauce! Yup… tomato sauce made tomato free. Let’s talk about tomato-heavy dishes like Italian and Mexican fare… I got you covered! How the heck do you make chili without nightshades?! Oh… I’ve got you covered there with this instant pot nomato chili! 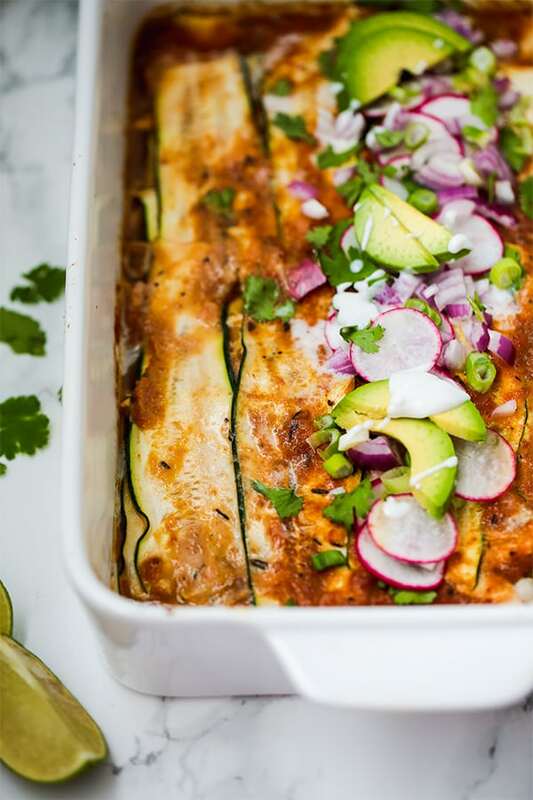 This zucchini chicken enchilada casserole comes with a nightshade-free enchilada sauce, which is not something you see every day at your local Mexican restaurant! This one pot lasagna skillet is grain free, dairy free, and nightshade free! Hallelujah! Zucchini is a similar texture for eggplant and can be a good swap! These zucchini fries are similar-ish to eggplant parmesan! Jicama is often referred to as a Mexican potato. I like to describe it as a mix between a potato and an apple. Starchy, but crunchy! They’re also high in prebiotic fiber which feeds our good gut bacteria. Another amazing potato sub for making chips, fries, and more! Cumin is a seed spice (so, not AIP) that’s nightshade free and has a great kick to it. One thing to note is that it’s green! I’ve made chili with cumin before and watched it turn green and was super confused… it’s the cumin! Black pepper is also a seed spice (not AIP) but it’s not a nightshade and is always a great swap to add spice. I’m constantly using turmeric to swap for red spices. It adds color, a bit of spice, and tons of flavor! 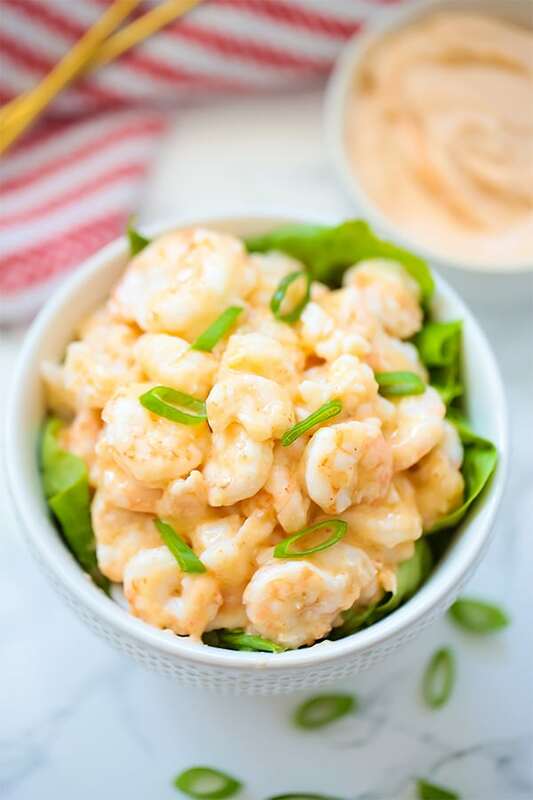 This bang bang shrimp recipe is one of my favorites and features a nightshade-free bang bang sauce. It’s 100% possible. It all depends on how your body heals, and your own bio-individuality. For someone like me, I’m not sure if I’ll ever be able to reintroduce nightshades. I just have such a gnarly reaction to red spices, peppers, and potatoes. However, tomato is the one nightshade that I can be slightly flexible in moderation. Many people do reintroduce nightshades, but it really just depends. It may not be in the cards for everyone, but there certainly is hope! Following an elimination protocol that allows for healing and slow reintroduction like the autoimmune protocol is an amazing way to tackle this. Regardless, I hope this list helped you see how much opportunity there is to substitute nightshades, and how to live with the intolerance! I’m so relieved to know there is a way to have pasta and sauce without getting sick! I really miss these flavors. I am not very sensitive to nightshade but I try to avoid them once I have Sjogren’s and Celiac disease. This article is so encouraging! It makes me feel good about my healing process. Thank you! When I avoid nightshades, especially tomatoes (which I love), I sleep better than I have slept in 20 years. It’s amazing. Wow John Spoolman thats AMAZING and Encouraging. I cant wait to sleep good again. Its been since 2001. Bell peppers have never agreed with me. Always caused indigestion. My first gall bladder attack was caused by bell pepper. Could not even think the word without getting sick. And, have never been crazy about tomatoes. A real sacrilege in the South!! Seems my body was telling me what it could not tolerate. But I love eggplant!! Thanks for confirming what I was thinking. My post states that those with arthritis may have issues with nightshades. It doesn’t say that they all have nightshade issues. As for nightshades not being inflammatory, see this study where it was shown that those with preexisting IBD issues had an inflammatory response to nightshades. Nutrition can be picked at all day from every single angle. There are very few definitive answers. I’m simply sharing general information about what some (not all) people experience and my recipe suggestions for nightshade free recipes. Beautifully stated Michelle. There’s no one size fits all approach but as a 32 year old recently diagnosed with ra, I’ve already figured out that eliminating gluten and nightshades has improved my pain significantly and I’ve only just begun an elimination diet to figure out what causes my body more inflammation. Thank you so much for discovering and posting recipes! Thank you so much, Elissa! I’m so glad that you’ve been able to eliminate so much pain! Nightshades are a problem for me too. I have psoriasis and have been clear for five year. Part of my protocol involves eliminating nightshades. It took Doctors years to listen to those who said scurvy was caused by a simple vit C deficiency. Just because there’s not a whole stack of studies (who would benefit and fund those?) does not mean the information is false. You should add kidney disease to this list. I have medullary sponge kidney in both kidneys and having inflammation in my kidneys is probably the most painful ever. Especially with all my stones I have embedded in them! Thank you for this page!! I have hidradenitis suppurativa which is an autoimmune condition effecting the sebaceous glands and removing nightshades from my diet has been the only thing that has helped. It actually put my disease into remission, which doctors previously told me was not possible. I have HS too. Had it for over 20 years now and have only just recently realised nightshades for me are a real trigger. Especially potatoes ! I miss potatoes! I suffer from what doctors call sero negative arthritis. i.ei they dont know what it is but it creates inflammation throughout my body. recently I discovered through exclusion diet that my inflammation decreases with excluding tomato and potato and increases with addition of these foods. I now avoid these but feel there is some other trigger. After seeing this atricle I am now confident that the Red spices and peppers are the most likely cause of my residual problems. Everyoe looks at me like I am crazy when I say I am “Allergic to Tomato and Potato” but this is the best way to get cooks to steer clear when I order food. Keep upo your good work informing people of POSSIBLE causes. At the end of the day each of us needs to be responsible for our own health. Even the immunology department at PA hospital have said they cannot deal with Intolerances as they do not have funding. It took me 7 years on the wait list to get to see them and 3 visits for them to discharge me. So I think the information provided in this blog are supported, not refuted, by the article you cite. Thank you for providing the reference and link either way so readers can be informed and decide for themselves. What symptoms do you personally attribute to nightshades? Thanks for your post and the alterative food suggestions. I found it very helpful. Its sometimes difficult to cook flavorful meals when so many foods, including nightshades need to be eliminated from my diet due to painful symptoms associated with my Hashimoto’s disease. So glad it was helpful, Jacki!! I am so glad I came across your website! I am in the beginning of the AIP Protocol for Hashimoto’s. I have been taking Ashwagandha Root for a couple weeks because I have read it is great for the thyroid, but then I have seen Ashwaghanda on some AIP lists of foods to avoid because it is considered a Nightshade. Do you have any information on this? Rodiola is the only AIP approved adaptogen 🙂 I would work with a to figure out what other supplements would be a good idea! Recently diagnosed with Hashimoto. Are mushrooms considered a nightshade veggie? Some lists say yes, others no. In my own research and experience, they are not. Some may argue otherwise but I do well with them personally and see many others who have issues with nightshades but are fine with mushrooms. Please understand what nightshades are. There’s edible nightshades that actually heal the body. Peppers for one – green peppers are unripe peppers that turn red, yellow, orange. For many it’s not necessarily the nightshade but what they are adding it to or putting on that nightshade that’s causing the issue. I agree that for many people (the majority of people, really) nightshades aren’t an issue and have a place in a healthy diet… I mention this in the post as well. However, there are also a number of people who don’t do well with them, myself included. I’m simply sharing a resource to help those that don’t do well with nightshades. This is been the MOST helpful article I have stumbled across in the past year of trying to regulate my diet due to Psoriatic Arthritis. I do not particularly know if all of these foods have a huge correlation to my inflamed joints but I am doing everything I can to help prevent inflammation. Thank you for providing this wealth of knowledge and information! Michelle – Can you reduce the effects (maybe eliminate them) by pressure cooking the nightshades? Are you referring to lectins and how they affect individuals? The solanine is actually more of the issue. Pressure cooking or cooking, in general, may help some people, but it really doesn’t make much of a difference in the actual chemical properties of the food. I love tomatoes and i cried a lot when i was diagnosed with an autooimmune disease. But relieved when i read that people can do well without nightshades too. Thanks for the articles and recipes. It’s not for everyone, so I would work with a nutritionist to figure out the best diet for you personally. Hi, I’m also vegetarian. Have been for 29 years. I’ve recently had to eliminate dairy because of strong sensitivites. In working with a nutritionist, I’m also eliminating gluten, soy, corn and sugar for now. Plus the nightshades due to problems with inflammation. It has been very challenging to figure out what to eat, but a whole new world that has been opened up to me. I’ve found plenty to eat once I read a lot of cookbooks and articles and asked people for info. Good luck to you! As I have been trying to figure out which foods trigger an IBS attack, everyone one of those on the nightshade list is a trigger, especially tomatos! I just hate this! I totally adore Mexican, Italian food and pizza! And the last time I had pizza, I had put some bell pepper on top then suffered all the next day with intense colon spasms! Won’t do that again! Thanks for the info on nightshades! Thank you so much for this blog and for sharing your journey with us. I have been struggling with chronic fatigue and swelling for awhile now. Its gotten worse the last two weeks and needed some answers. I have hypothyroidism and was eating rice, eggs, tomatoes and many other food included in the avoid list, especially coffee. How do you get energy without drinking it? I grew up drinking coffee and never had reactions to it as I do now. I didn’t always feel this way when I ate those things, but I can feel how they trigger the symptoms worse. And I’m sure once I start my medication it’ll give me some drastic changes. I appreciate your help. I used to drink 2-3 cups of coffee daily, but I’m completely off of it now except for the occasional cup as a treat. It is totally possible to quit coffee! It’s hard but possible! If not, tea like black tea and matcha are good alternatives. This is a great article. I am half way through Whole 30 (4th time over 3 years) and each time, although thinking I was elliminating all foods that caused stomach distress, sore joints, I wasn’t. I refuse to accept this as getting older…I’m only 54! I am quite sad to think nightshades could be the issue. I am excited to embrace new cooking styles, still learning…and those hidden ‘trigger’ spices are tricky. Something gives me a ‘hangover’ type headache. Always thought it was wine, now I know different. I would think that inflammation could cause headaches too? Again thank you for the insight. I’ve for sure had plenty of headaches from food sensitivities like nightshades. Everyone’s symptoms are different, but I’ve experienced that too! Michelle, thanks for this information. It’s very helpful to understand some of the foods that may cause some of us health issues. A lot of this makes sense for those of us who know our bodies and food triggers. Traditional medicine is not always the answer has been my experience. Had a client eat potatoes for a month straight and ended up with a clogged gallbladder. I also have Hashimoto / hypothyroidism and this is the first time I got to know this perspective that nightshade vegetables are not good for it. After cutting them from your diet and reintroducing them do you only feel the difference in your body or can you also see the results on a lab test? And just out of curiosity, do you eat gluten, dairy and eggs? First of all thank you so much for this informative article. I was diagnosed a year ago with Hashimotos and have been a bit depressed over the things that have been taken out of my diet and not coming up with things to replace those I love. I have been told I need to be gluten free, grain free, dairy free, lentil free and nightshade free. That doesn’t leave much. Under the list of nightshades my doc included broccoli, cauliflower and mushrooms. I don’t see those in the usual nightshade list. Then someone told me that Cauliflower and broccoli were OK if they were cooked. I made a cauliflower “casserole” with a little bacon in it and baked it well. I won’t do that again as I was awake most of the night with indigestion. Thank you for your suggestions and recipes above that will enable me to make that lasagna and spaghetti again with alternative ingredients. I can’t wait to try them and learn to still eat the things we love but just altering the ingredients. I would for sure work one on one with a nutritionist on this. Broccoli, cauliflower, and mushrooms aren’t nightshades, but cauliflower and broccoli are high-fodmap. A lot of people who have digestive issues also have fodmap issues, so that may be something to bring up to a nutritionist! Good luck! Thank you for this information. I have problems with most of the nightshades. Potatoes don’t seem to be problematic. Eggplant and raw tomatoes will blister the inside of my mouth and make it peel. Bell peppers and cooked tomatoes will give me terrible indigestion, same with lots of spicy foods. Having options for replacement foods is awesome.